This spiral rope has a multiple of looks depending on your bead choice and bead sequence. 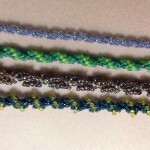 This versatile technique is easy to master and you’ll be amazed at how quickly your work becomes a beautiful bracelet or necklace. Included in the class will be two finishing techniques.